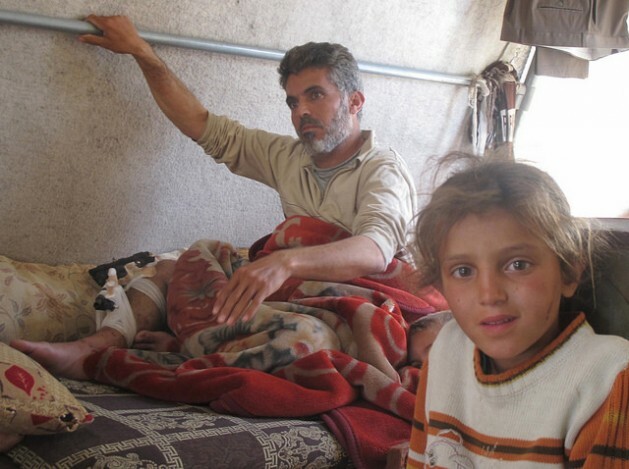 REYHANLI (TURKEY), May 19 2014 (IPS) - As once-eliminated diseases resurface and barrel bombs and alleged chlorine attacks target civilians, doctors in rebel-held areas and across the border struggle with issues of how best to serve their profession. Up to 70 percent of Syria’s health workers had fled the country as June last year, according to the World Health Organization, and many of the country’s medical facilities have been destroyed or heavily damaged by regime air strikes. Though regime and opposition fighters are often said to share the blame for obstructing access to medical care for civilians, Dr. Omar, who works with the Syrian Expatriate Medical Association (SEMA), said that his organisation has not experienced problems with any rebel groups while working in Syria. However, he stressed that his work ended when the patient – whether rebel fighter, regime soldier or civilian – had been treated. “My work stops there. What they do with them afterwards is not my business,” he said, stressing the need for neutrality in order to continue operating in areas even when they change hands from one group to another. Doctors Without Borders (MSF) has long been known for the same code of ethics, but nevertheless had five of its expatriate staff taken hostage in early January, most likely by the fundamentalist group Islamic State of Iraq and Al-Sham (ISIS). More moderate factions have pushed the extremist group out of much of rebel-held territory in the north in recent months but the medical workers’ whereabouts remain unknown. MSF decided to pull all foreign staff from Syria after the incident but continues to operate several makeshift clinics and mobile facilities in the country using Syrian personnel. It also supports local hospitals. The international NGO – which, Dr. Omar notes, was ‘’the first group to send us money and support in 2011’’ – has not been able to register with the Turkish government and is thus unable to establish official offices across the border. He said that he had recently been in Kasab, part of a coastal area seized in late March by rebel fighters, to set up medical facilities for ‘’damage control and sending them elsewhere. That’s all we can do right now’’. Save the Children recently reported cases of doctors forced to give children unnecessary amputations and patients choosing to be knocked out with metal bars rather than undergo surgery without anaesthesia, which is in short supply. There have been outbreaks of vaccine-preventable measles and polio that have begun to spread across the country’s borders. ‘’You go to jail if they find you with one,’’ he said. He was later one of four doctors working inside the country who met secretly with Syrian expatriate medical staff in the Turkish border town of Reyhanli in November 2011 to start working alongside the Union of Syrian Medical Relief Organizations (UOSSM). At least 440 medical personnel have been killed in the ongoing conflict, reports Physicians for Human Rights, while many hundreds of others continue to be held in regime detention facilities. The border town where Dr. Omar works when he is not inside Syria has changed dramatically since this IPS correspondent’s first visit in 2012. A few makeshift care facilities and injured fighters propped up on porches under ‘internet café’ signs or treated in disused hotels and homes have been replaced by a more organised system. Several medical facilities cater to the masses of injured, amputees and patients with spinal cord injuries who have made it to this side of the border, and ragged-looking Syrian children begging in the streets are a common sight. A clinic specifically for prosthetics, the National Syrian Project for Prosthetic Limbs (NSSPL), has been set up on its outskirts, and short courses are held for would-be physical therapists, many of whom are medical students forced by the conflict to abandon their studies. A 29-year-old physiotherapist working here told IPS that he had been arrested in early 2011 on terrorism charges and briefly joined a rebel group after being tortured in jail. He found, however, that he was unable to make himself kill anyone. He claims to be one of only a few fully trained and medically certified Syrian physiotherapists now in the town, as he graduated from the faculty set up in 2006 in Homs that closed only a few years later when war broke out. He and his younger brother were taken from his house in the middle of the night, and he spent ‘’34 days, 6 hours and 28 minutes’’ in detention. His family eventually found a trusted contact to whom they paid 30,000 dollars to have him released. His brother, who worked with the Red Crescent, is still in prison. His family has meanwhile paid several thousand dollars to get him moved to detention facilities where they can occasionally visit him and refuse to leave the area unless his brother comes with them.